See view bedroom, bathroom and open-plan kitchen with dining area (35m²). The apartment is part of our house but with a separate entrance. It consists of a living room with a sofa bed (suitable for 1 adult or 2 children), open-plan kitchen and dining area, separated bedroom with a double bed, and a bathroom with a shower. The bedroom looks over the small port of Srebreno, and has a balcony with deck chairs and a side table. There is also a terrace with a dining table next to the entrance to the apartment. The apartment has air conditioning, Sat TV, free wi-fi, a clothes iron, a hair dryer and a washing machine. The kitchen has a stove with two electric rings and an oven, fridge and kettle. I was born in Germany but have lived in Dubrovnik and Mlini most of my life. I am a representative for a tour operator, and my husband is an IT teacher at a local school. We live with our two sons, a teenager and a student, in a 100-year old house which has been in my husband's family for many years. We have been lovingly renovating and decorating the house, and 2016 we created the Lavender apartment which our friends and guests can enjoy. Come and stay at our lovely apartment, step out onto your balcony and let the holiday begin. Overlooking the small port of Srebreno and moments from the sea, restaurants and bars, this is the perfect place to relax, and explore everything the area has to offer. We are happy to recommend places to visit and restaurants to go, or listen to your discoveries. The apartment is accessed from a street which continues on to the sea, less than 100 m away, with beaches where one can rent sunbeds and umbrellas and enjoy a range of activities – kayaking, jet ski, parasailing, diving. In the two small bays of Mlini and Srebreno there are about 10 restaurants, cafes and bars, while the park between the two villages has a children's play area and an exercise area. The Sheraton hotel is very close to the apartment and offers a variety of amenities (at a charge), such as a spa and indoor pool, and tennis courts. Opposite the hotel there is a food market and a shopping centre with a large supermarket. Close to us is the bus station with buses to Dubrovnik and Cavtat, approximately every 30 minutes. Bathroom with shower, hair dryer, towels are included. Living room with sofa bed (suitable for 1 adult or 2 children), open-plan kitchen and dining area for four persons. The stove has two electric rings and an oven. 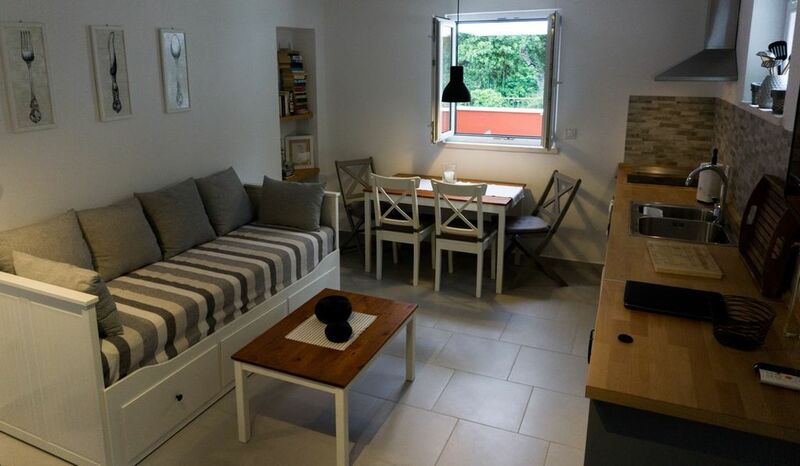 The apartment has a open-plan kitchen and dining area for four persons. There is also a outdoor terrace with a dining table for four persons next to the entrance to the apartment. The balcony has two deck chairs and a side table and looks over the small port of Srebreno. Less than 100 m away is Srebreno beach where one can rent a kayak. Less than 100 m away is Srebreno beach where one can rent a boat. A terrace with a dining table for four persons next to the entrance to the apartment. Less than 100 m away is Srebreno beach where one can rent and enjoy a range of activities – kayaking, jet ski, parasailing, diving. The Sheraton hotel is very close to the apartment and offers tennis courts. We absolutely loved our first visit to Croatia. As a family of four we travelled to attend a friends wedding and found this little gem of an apartment! It was an ideal location for us as it was in between Dubrovnik and Cavtat. Milka and her family were so welcoming. Milka was very helpful and informative, she ensured we had everything we required for our stay. The apartment was clean, spacious and had everything we needed and more. The little touches made a very big difference to us as a family; and made it feel very homely! I wouldn’t hesitate to recommend to friends and family! We were on a family vacation with our 2 young children. The apartment was decorated with love for the little things that make a place homely. It was very clean and within walking distance to the beach (which was very important to us). Milka and her family are incredibly lovely people and we really hope to see each other again someday. My partner and I could not have asked for a more lovelier and welcoming stay in Dubrovnik. We had an amazing time and staying at this property made it so wonderful! I want to say a big thank you to you Milka and your family for making us feel like at home. You were so helpful and kind and we can say we have made new friends! And your place is so cosy and comfortable and a beautiful place where to spend a vacation. And the view from the bedroom is just stunning! Thank you! Das Appartment ist überaus gepflegt und dürfte auch ganz neu sein. Es besteht aus einer Wohnküche, einem Schlafzimmer, einem Bad und zwei Terrassen (eine davon mit Meerblick). Zum Strand und zur Promenade sind es nur zwei Gehminuten. Die Vermieter sind unglaublich freundlich und hilfsbereit. Wir haben uns sehr, sehr wohl gefühlt.